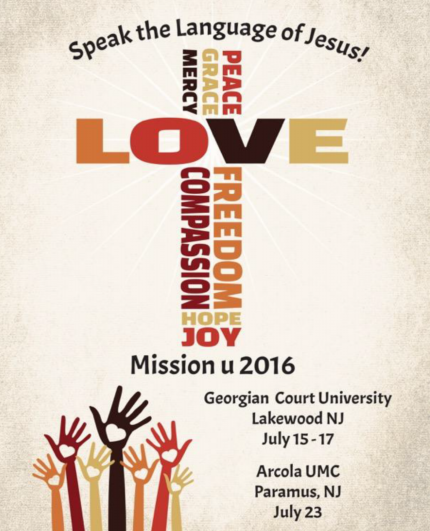 The Cooperative School of Christian Mission’s 2017 Mission U program will take place this summer with two sessions: a three day school from July 7 – 9 at Georgian Court University in Lakewood, and a one day event on July 22 at Arcola Korean UMC in Paramus. This year’s program will pursue studies under the general theme of “Live What Jesus Taught.” The program’s centering scripture comes from Romans 12:9-10 of The Message version of the Bible, which reads: “Love from the center of who you are; don’t fake it. Run for dear life from evil; hold on for dear life to good. Be good friends who love deeply; practice playing second fiddle.” Mission U Dean, Rev. Richard Hendrickson, invites all – men and women, laity and clergy – to experience new opportunities for learning, worship and fellowship. Youth and children are invited to attend the three day school where classes designed for their age groups will be offered. To encourage new people to attend Mission U, first-time, full-time attendees will not pay the $40 registration fee. They will pay only housing and food fees, receiving a $40 discount. All who attend will not only engage in study, there will also be time for strolling through the campus gardens, swimming, bird watching, nature hikes, movies, tours by an arborist, a tour of the mansion, and other activities. Living as a Covenant Community – a spiritual growth study of major covenants throughout the Bible, taught in English and Korean. The Bible and Human Sexuality: Claiming God’s Good Gift – a study that helps explore the complexity of the biblical text and varied understandings of human sexuality, taught in Spanish. Missionary Conferences in the U.S. – a geographic study which lays a foundational understanding of the three U.S. Missionary Conferences of the United Methodist Church: Alaska United Methodist Conference, Red Bird Missionary Conference and Oklahoma Indian Missionary Conference. Climate Justice: Call to Hope and Action – A social action study designed to deepen understanding and awareness of climate change and its impact on God’s creation, taught in English and Korean. The Sea Is So Wide & My Boat Is So Small – The Conference Study at Lakewood in which the focus is on the role and responsibility of the faith community impacting children’s lives. Vulnerable Children – The Conference Study at Arcola Korean UMC will focus on ministry to special needs and autistic children. The Youth School – open to coed youth ages 12-18 who have completed grades 7 through 11, will focus on the country of Sierra Leone, its history, struggles, and reality. Along with the study, participants will be taking part in various activities ranging from swimming to movies, bowling to games and hands-on mission. The Children’s School – Offering two classes: one for children who have completed grades K-3 and one for children who have completed grades 4 – 6. The children will learn about Missionary Conferences in the U.S. A guardian must be on site attending the Adult School of Mission U. Mission U is co-sponsored by The United Methodist Church of Greater New Jersey and the GNJ United Methodist Women (UMW). Mission U endorses and abides by all Safe Sanctuary guidelines. For more detailed information, access to full brochures and registration forms with costs, click here.